Ok, so it’s completely unrelated to VB in every conceivable way <g>. I just came across a very nifty way to tie your shoes. It’s called the Ian Knot and there’s a very good pictorial writeup (and video) about it here. make a crossover knot, the way you would normally start to tie your shoes. In the right hand, make a loop exactly like you normally would, with the string going up, over your finger and down. In the left hand, make the same loop, but with the string starting below your finger and coming up over your finger towards you. then just push the two loops through each other and tighten. Check out the site above for pictures. It’s easier to see it than describe it. But, it IS amazingly fast, and easy. Just came across this excellent little book. Originally published in 1868, it’s a compendium of just about every sort of mechanical means of transferring one type of motion to another than you can think of. Lots of illustrations. Makes a great reference, and the best part, it’s available free online in a djvu version. It’s a 75mb download, because the book has just been scanned in (even the text), so it’s not really searchable. If you’re into steampunk in any way at all, this is a must have reference book. As a side note, while the DJVU format and viewer is quite nice, I preferred a PDF version. It took some effort, because, when I tried to convert it (using the PRINT function from DJVU into a PDF printer), I kept getting errors about the Courier font not being found (which it most definitely IS installed on my machine). After some fiddling, I ended up being able to “print” it to the “Office Document Image Writer” printer driver. I then loaded that file up into the Office Document Image Viewer, and printed to the PDF printer from there. I’m a space buff so I’ve been following the Phoenix mission for a while now. It finally arrived at Mars and successfully landed 5 days ago (Sunday). That in and of itself is incredible, considering some of the recent failures NASA has had. This landing went picture perfect, though. But what’s even more amazing is that the Mars Orbiter, already in orbit around Mars, was able to snap a picture of Phoenix as it was parachuting to the surface!. Just contemplating the enormous number of tasks that had to be done just right to pull that off can make your head spin. Granted, it’s not a frame from “The Right Stuff” but still, you gotta give the guys at NASA props for pulling this off. Here’s hoping Phoenix performs even half as well as the other two scamps, Spirit and Opportunity, that have been scurrying around farther south for more than 4 years now. Occasionally, though I come across something that’s (at least to me) pretty interesting and actually worthy of the title. Here’s one of those things, built by a sculptor in Burnley, UK. Almost completely unrelated but something none-the-less interesting, is the work of Theo Jansen. Here’s his Animaris Rhinocerous. Makes you want to grab a torch and some pipe, eh? I can see doing a lot of things “online”. Email? GMail is pretty dang slick, with a spam filter that’s second to none. Stock Portfolio and watchlists? Sure. Craig’s List Searches? Right there on my homepage. Word Processing? Spreadsheets? Hmmm. Google apps is definitely interesting, although I tend to want to keep my files close at hand. Call me old fashioned, but the thought of putting access info to my entire checkbook/credit card/bank account/investment accounts online just seems a little, uh, risky? Hell, it’s probably all already out there, but is it really a good idea to put concentrate all that in one place, online, in the ether on someone else’s server? I suppose SalesForce.com asks their customers to do it every day (after all, isn’t your company’s client list a bit like your ledger?) and nobody has much of a problem with it. So maybe I am old fashioned. Build your whole financial picture for up to 5 years. Most banks keep your online data for only 60 to 90 days. from the day you start. We keep active customer's data for up to 5 years. 5 whole years! How generous! And I guess after five years, all that data would be useless to me? Um. I don’t think so. Guess I’ll stick to the tried and true for now. NASA has a nifty little “picture of the day” feature that you can add to your Google Homepage. But the thing that struck me about this is how much our space program is beginning to resemble the Millennium Falcon. The rusty tanks, the patchy paintwork, using a stapler for repairs. It’s starting to look like the shuttles may have made the Kessel Run a few times themselves. This project has been out a LONG time (looks like it was last messed with in 2001), but I hadn’t seen it before and the specs are definitely worth a read. Essentially, as a project, these guys built a pretty simplistic programming language that ends up looking very similar to a Shakespearian play. Like I said, you gotta read the specs to fully appreciate it. Variables are declared in the Dramatis Personæ section. They enter scope not by virtue of functions but by Enter, Exit and Exeunt declarations. Lady Macbeth, who pushes him around till he pops. Act I: The one and only. Scene I: In the beginning, there was nothing. Scene II: Pushing to the very end. Open your mind! Remember yourself. If not, let us return to scene II. Recall your imminent death! 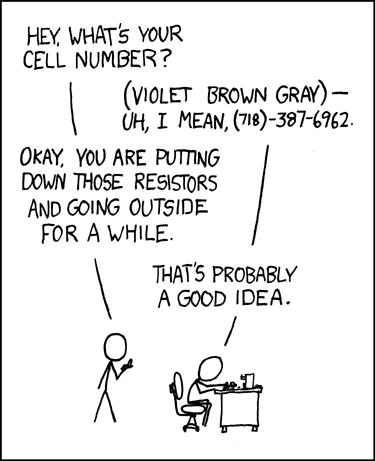 Anyway, pretty clever, funny stuff, that is, as long as you’d find this pretty clever and funny (and if you haven’t been to http://xkcd.com, it’s worth the trip). Paul Moller (the aircar guy) has finally made at least one of his designs available for sale, the Volantor. Ok, it’s a tad goofy looking, and at 125k$ plus, it’s bit out of, oh, damn near everyone’s, price range, but still, it is for sale. Personally, I’m waiting to see the first M400 flying around. The amazing thing to me is that this guy has been working on this idea since the 60’s, developing all sorts of technology in the interim to fund it (and contribute to it). Dr. Moller, keep it up! You think your computer problems are bad? How’s this for a rough IT problem. Apparently, the ISS is having some difficulties getting several fairly important systems back online after some problems. Of course, if they need computer help, I’d love to offer to take a trip up to help debug things<g>. Wouldn’t that be an awesome GeekSquad tech call! Completely unrelated to programming, but very cool anyway. Mexican geologists discovered a cave filled with giant (and by giant, I mean some as much as 36 feet long) gypsum crystals. There is a great picture of it in the latest National Geographic. At this point, I’d love to include a picture of one of the crystal caves, I’m just not sure about copyright issues surrounding doing so. I suspect it would be ok, but better to err on the safe side. Anyway, check the full article here. Be sure the next through the pictures.